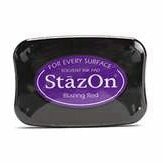 StazOn is ideal on all non-porous and semi-porous surfaces. These surfaces include transparencies, vellum, glass, glazed ceramic tile, metal, acrylic plastic and much, much more! With StazOn, you'll achieve a beautiful "stained glass" appearance, due to the transparent nature of the ink. Acid-free ink Archival Fast drying solvent ink Dries in 3-5 minutes on non-porous surfaces and stays on!